Soap was prohibitively taxed in Britain between 1712 and 1853, and by law could only be sold in large blocks. Both of these measures effectively trampled competition from small scale manufacturers, but also made soap more expensive and more difficult to come by. When the prime minister, William Gladstone, finally repealed the soap tax, smaller businesses entered the market for the first time. The size restrictions on soap production were also relaxed, and mass-produced bars of soap became popular. 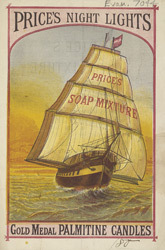 Indeed, it allowed for a wider range of soap-based products to be developed and sold, such as the night lights and candles also advertised here.